There’s something about these conventions that just feels… right. It’s a celebration of our hobby, and our culture. You can end up chatting to complete strangers about anything from Steam DRM to Mega CD loading times… in short, you can really geek out here. And it’s also a great introduction to retro gaming for some people whose first console was an Xbox 360! Anyway, I digress. Myself and my good friend Mike have attended the Manchester Play Expo numerous times, and we decided to take a little trip to nearby Blackpool to see what their version was like. We got the train up on Friday night, checked in to a hastily booked B&B and promptly hit Blackpool’s Arcades/Bars. People have fond memories of Blackpool. The seaside, the Piers, the buzzing nightlife. I’ve not been on Blackpool’s guestlist for several years, and as we trekked down the promenade in search of Arcade machines, I felt a twinge of sadness. The whole strip was eerily quiet. We passed a couple of Hen parties, a few stragglers, but not much else. The buildings we passed en route brought back happy childhood memories, but looked run-down and tired. Still, after getting inside Blackpool’s famous Coral Island, I perked up. Bright screens, loud music and those 2p machines recently turned into a game show called Tipping point, it was all here. We got change from a lady in a booth, whose only function was to give change… how 80s is that? And set out to have some fun. We settled on racing game Outrun, a novel concept because 2 players take turns controlling the same car. That caused a few laughs and warmed us up. Lightgun action followed, Time Crisis 4 was really good and Rambo was Hilarious. After milling around for a little longer, we left the island for a beer break. I’ve known Mike for nearly 15 years. We work at the same place and we’ve always played games together, but this was the first time in a long time we’ve had time to just sit together, chat about games, about life, and about the convention the following day. It was a really good catchup and feeling a little merry, we set out to find one more gaming blast before bed. What we found was Dark Escape 4D – Mike’s highlight of the Entire weekend. It was a complete revelation to us! The machine is curtained off like a photo booth, and when you step inside the interior is completely black. Both donning 3D Glasses and gripping twin controllers, we pumped in a few pounds. The game starts. Hilarious acting lured us into a false sense of security (easy enough considering the happy beery haze we were in!) and then the game started proper. BOOM! BANG! MOOOAN! Yeah, there are zombies in this game, and the speakers are cranked up really high. If that wasn’t enough to make you jump you get vibrations through the controller and air blasted into your face every time a nasty pops up! It’s frantic, blasting action. We toddled back to the B&B, back along those deserted streets. Blackpool was beginning to resemble a ghost town! Saturday Morning came, and after the aforementioned return to the 4D machine, the journey to Play Expo started off with a hiccup. We went to the wrong building! The walk towards the real building went on, and on, and on. Seaside air is great but there’s truly a limit to everythng! After surrendering and jumping into a taxi, we arrived. The place was huge… it’s actually a castle! And finding our way into the Expo hall felt like the last leg of some epic journey! We decided to hit the market stalls first, based on the idea that we could pick up some decent games/accessories before they were snapped up. There were plenty of sellers and tons to choose from, but the computer games (Spectrum, Amstrad, Amiga etc) were strangley absent, It was all console stuff! I found ONE spectrum game sat on it’s own (Alien8 by Ultimate Play the Game!) and snapped it up. The prices seem to get higher every year too, maybe games are just getting rarer! I had a good look round, and chose a few bits and pieces. My pick of the bunch is a Sonic 2 art print, signed by Duncan Gutteridge, the man responsible for creating all the Sonic art back in the days of the good ‘ol Megadrive. A bargain at £5. Carrirer bags in hand, we got round the Arcade Machines. Most of the big name games are always occupied, but I enjoyed playing some of the more obscure machines and had a great time with old favourites like Pacmania and Metal Slug. Consoles Next? Yeah why not! I played tons of these, the Expo had hundreds of consoles set up and there was always something available to pick up and play! I made notes of a few great new games that I wanted to try when I got back home. I also played on some old favourites, including my beloved Vectrex and the mighty little PC Engine! We had some food – a low point of the day because the only place serving food in the immediate vicinity was tiny and very poorly ran. There was nowhere to sit and eat either! Next was another circuit of the market stalls, just because we could. And every time I caught up to Mike he was picking up more boxed N64 games – that collection must be fairly gnarly now! We also played a preview build of Sociable soccer, the spiritual successor to the Amiga’s Sensible Soccer – it’s really good! After a last foray through the dark dungeon-like main hall, we called it a day. No taxi rank outside, so we walked back down the way we’d came, hoping to flag one down. We probably walked 15 miles that weekend. I’m not even joking! A train took us back to happy Manchester, and we even played a little Game Boy Advance on the way home! Reflecting on the trip, it was a very good experience. Some things could have been better, but we may have been spoilt by the gigantic Manchester version. We’ve decided to go back next year, but I might double-check the venue location before we do! Sorry that turned into a bit of an essay. Hope you enjoyed it! Below are a few more piccies in the form of a gallery. The game is far better than the name implies! Huh! Never knew this was a thing. Klax! Pickup and Playability: 100%! Super Mario: The Arcade game?? The PC Engine, with rare CD addon! There’s my baby. VECTREX LOVE! 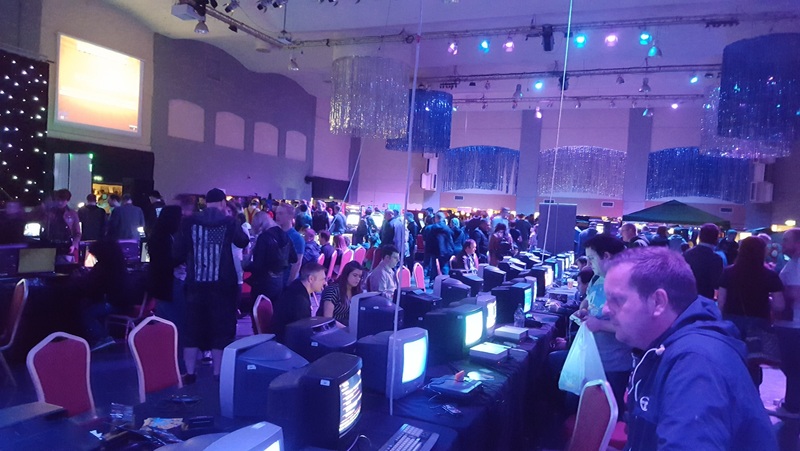 Posted on May 22, 2016 June 2, 2016 by itsonlyleggyPosted in Feature, RetroTagged Expo, Journey, Play Expo. Previous Previous post: Attention: LOAD/ERROR! Great convention leggy definitely looking forward to going again and would recommend it to anyone who hasn’t been.